Question: On one hand, Israel has an external problem, constant air strikes, and on the other hand, within the people, there is a split into many factions and directions. Everyone pulls to his side and hates others. How does this internal separation affect our external security? Answer: The reason is the same: there is no connection between us. Then of course, there is a split between us, and we do not agree with each other. Only a tiny part of the population has knowledge of the need for unity, of the method of unity. All the rest don’t know it yet, and they are not very interested in hearing about it. Therefore, it is not surprising that there is such disunity and division within the nation. Everyone cares about how to get personal benefit from this situation. There is only one reason: lack of connection. So, we should stop blaming those external enemies surrounding us on all the borders, as well as the internal enemies, that is, our egoism that separates us and makes us hate each other for no reason. You just have to start working against it. There is no other means of correction. Question: In our world we use money and military power in order to changes things. How do we change the spiritual system? Answer: The system changes when the lower is adapted to the upper. 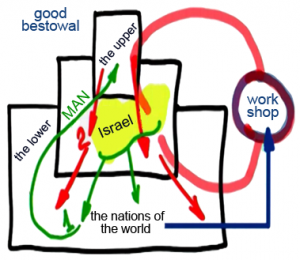 Israel is in the middle and has to adapt the nations of the world to the upper force. 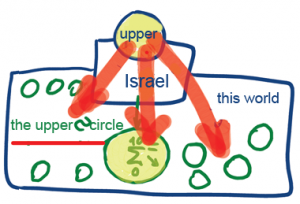 This means that Israel has to descend to connect the other nations with the upper level by closing this circle. This kind of adaptor is made when we organize a group or a roundtable in the middle. Our mission is to draw the nations of the world to such discussions and roundtables, and to bring them to the form of the upper, which means to the force of love and bestowal. We have to bring them as close as we can to the upper force, to bestowal, by making them resemble it. If a person goes out to the nations of the world and organizes them in a circle, they take on a form that resembles the upper. This circle is made of several people (let’s say ten) who unite equally as each one sees the other as higher than himself. Such a round structure resembles the upper level, and according to the law of equivalence of form, the lower circle and the upper level are connected according to the resemblance and the equivalence between them, through Israel who brought about this adaptability and equivalence. Thus the two parts begin to feel one another and the upper Light is poured from Above through Israel into the lower circle. The more we expand this circle and create more identical circles that connect, the more the upper force can be revealed. Then Israel can become the pipe through which the Light that Reforms pours from the top down and influences the whole world, all the circles. This is how Israel will fulfill its mission of bringing the Light to the nations of the world. If I feel that I have no desire, no yearning, no power to move, and I cannot do anything, I must be incorporated in the friends even more, even if I have no desire to do so, and then I will receive this desire from them. We live in a reality called this world in which we can perform actions that bring us the desire to do so, even if we don’t have the desire for it at first. This is called a desire without a desire. I simply come to a collective meal or a dissemination event in order to help the friends. It doesn’t matter whether I do it in order to feel their respect or to be proud that we are doing something important. I can give myself different egoistic explanations as long as I can be incorporated in the friends. I absorb their desire, even when we just sit and have a beer together. Thanks to that, my desire changes, and I already can begin to perform small actions that are related to the connection between us. I receive the friends’ desires, thoughts, intentions, awakenings, and the feeling of the importance of the spiritual path. Therefore, this world is the most important level of all. It is outside the spiritual world, but we begin every state, every level, from this world. When I was near Rabash, I used to wonder how this man who is always so happy, cheerful, and inspiring with burning eyes sometimes fell to a state of feeling totally dead, especially in the morning when he woke up and got up and walked around, looking at everything stunned, not understanding what was going on. He was totally disconnected from spirituality. However, we are so small that we have nothing to lose, and our detachment from spirituality is as minor as our connection to it. Rabash used to move slowly. He would sit down to have the cup of coffee I had prepared for him. I would read an extract from “The Study of the Ten Sefirot” to him, usually from chapter 16 that speaks about Adam HaRishon and the worlds of BYA, and then he would gradually wake up and begin to ascend. We should understand that every level, until the end of correction, starts from absolute zero from our world, like Rabbi Shimon who fell to the state of Shimon from the market, and it is from this level zero that we must grow until the height of the end of correction. We must collect material, which means desire for this level, from the state where we are outside the spiritual world, entering it each time anew. This is how it works. Answer: Time is the number of actions that we must perform in order to attain a predetermined goal, which is the final state of the end of correction in which we are all connected into one system called Adam (a human being). The time of evolution is a certain number of changes that we must make. We can hasten time by preparing ourselves for going through these changes in a more condensed manner. We cannot skip these steps, but they can be tightly condensed. Suppose that I prepare myself at home so that I can perceive and understand one lesson from the teacher at school, while my friend prepares himself in a much better way by reading extra material and thus can perceive five lessons at once. This means that he hastens time and skips above it. He doesn’t skip the steps. It only seems that way since we don’t see that one action can include many actions. Time is measured by the number of actions, whether it is long or short, since in the spiritual world there is no astronomical time connected to the revolutions of the planets around the sun. We cannot leap above the steps, but we can condense them. It is impossible to leap over or to skip the steps because then you wouldn’t perform the necessary corrections, but we can prepare ourselves for that so that these corrections will be condensed into one. Everything depends on our preparation: on our readiness to listen, to perceive, and to join an even greater effort. This is possible only by connection with the friends. If I connect to the friends, my vessel becomes bigger, and it can include more, and then I can perceive many actions at once since all these actions are actions of connection, and if I advance toward them by myself, I can draw more Light. However, if I advance by the natural pace of evolution, in its time, I must wait until I am awakened for every action and then I respond. I shorten time only by rushing toward connection. The concepts of pleasure and suffering change according to my advancement and whether I value the Light of connection that is dressed in me as most desirable, and this also depends on the influence of the environment.